Extremely happy I start my day reading this brilliantly crafted haiga. The use of a parodic allusion to Michelangelo's The Creation of Adam is thematically and emotionally effective. And the disembodied description of the meeting of fingers of "God" and an "emoticon" is theologically and psychologically striking. 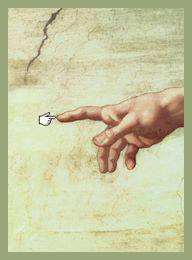 (In Michelangelo's painting, there are Adam, God (depicted as an elderly white-bearded man), angels). Thanks for giving me an outloud laugh! If, as Nietzsche stated, "God is dead," is it possible that God has been replaced by Mark Zuckerberg, co-creator and chief executive of Facebook?